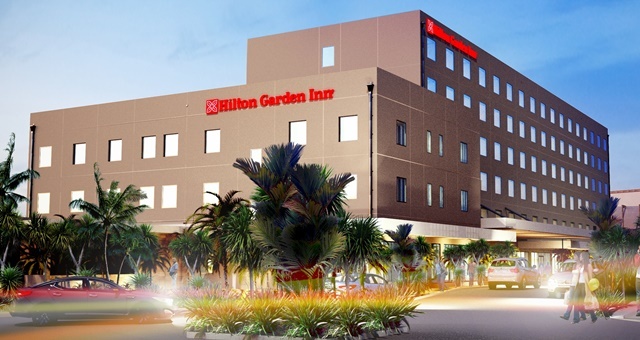 A rendering of the future Hilton Garden Inn Suva, which will open in around a year. Management agreements have been signed between Hilton and Carpenters Properties Limited which will see the development of two new Hilton hotels in the Fijian capital of Suva. The deal will see the opening in Q2 next year of the South Pacific’s first Hilton Garden Inn, which will offer 178 guest rooms, a restaurant and bar, fitness centre and swimming pool. The opening of Hilton Garden Inn Suva will be followed two years later by the flagship Hilton Suva. The newbuild hotel will offer 115 rooms, five suites and guest facilities including a restaurant and bar, fitness centre and swimming pool. Conference facilities will also be developed in the form of one meeting room and an executive lounge. Suva is currently developing a mixed-use waterfront complex featuring over 40,000 square metres of premium retail, dining and entertainment options, with the two new Hilton hotels to star as anchor properties. Hilton Senior Vice-President Development, Asia and Australasia, Guy Phillips said the company was thrilled to be working with Carpenters Properties Limited to open the two new locations. The development will take Hilton’s presence in Fiji to four hotels and resorts – complementing the existing Hilton Fiji Beach Resort & Spa in Denarau and DoubleTree by Hilton – Fiji on Sonaisali Island. HM understands Hilton is actively looking for opportunities to expand the Hilton Garden Inn brand into Australia. Plans are underway however precise locations haven’t yet been confirmed.